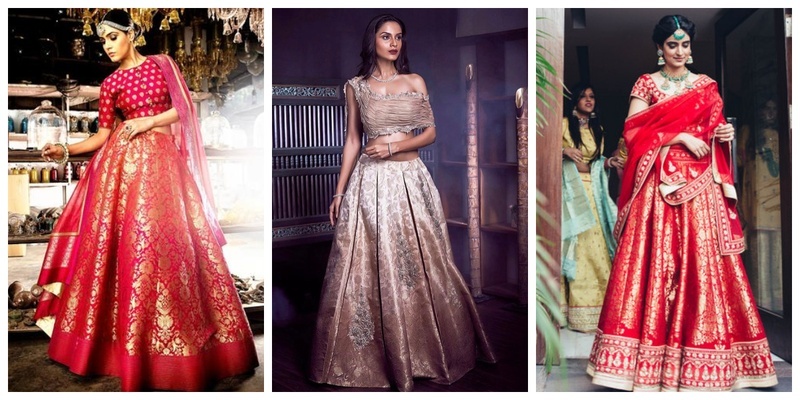 30 Banarasi Lehenga Images which will make you opt for one this wedding season! The beauty of a Banarasi lehenga is truly unmatched! The opulent silk fabric is intricately embroidered with gold and silver threads to give it a royal look. If you are keen on wearing a bridal lehenga that’s not too heavy but still looks regal, then a Banarasi silk lehenga is your go-to choice! Scroll down to see 30 latest Banarasi lehenga images, which you can save as an inspiration for your bridal trousseau. Red and gold is a classic combo for a wedding saree or lehenga. Loving how this bride has carried off an all red Banarasi lehenga with such grace! Bridesmaids, if you are looking for Banarasi lehenga images that have a contemporary touch to them, then you must save this pic immediately for major inspiration while shopping. This light pink Banarasi lehenga is a simple yet graceful option to wear for a daytime mehndi ceremony. Pairing this with floral jewellery will take your mehndi look to another level. Red and orange is a classic wedding lehenga colour combination! Opt to wear something like this for your main wedding ceremony. Banarasi lehengas are lightweight; so you can be assured that you’ll be comfy throughout the ceremony. This simple Banarasi lehenga choli is a great choice for bridesmaids or even the bride to wear for one of her pre-wedding functions. The possibilities of wearing a Banarasi lehenga on your wedding day are limitless. Pair it with a heavy-embroidered velvet choli and net dupatta to create a hatke look! Look straight out of royalty with a Banarasi lehenga design like this one! Doesn’t this bride look every bit of a goddess rocking a red and gold Banarasi lehenga with a zardosi hem and net dupatta? Give your Banarasi lehenga a modern twist by pairing it with a bralette or a backless choli in a contrasting colour and wear it for your mehndi or haldi! Banarasi silk as a fabric looks royal. So, you don’t really have to add much effort to make it look extravagant. Just make sure to have a huge flare and add some can-can inside for volume and you're all set to rock a gorgeous Banarasi bridal lehenga! Experimentation is the key to great fashion! Totally in awe of this bride who paired her red Banarasi lehenga with a sequined choli and peplum style jacket! Apart from red, green is that one colour, which looks royal and festive at once! Love how this bride has paired her green Banarasi lehenga with a solid green choli while accessorizing with heavy neckpieces! You thought wearing a Banarasi lehenga for a reception or cocktail party would be too traditional? Well, looking at this banarasi wedding lehenga, you would change your mind for sure! The classy champagne colour of the lehenga paired with a ruffled one-sided, off-shoulder choli is what bridal lehenga dreams are made of! Here’s a real bride giving major #mehndioutfit goals with her multi-colour Banarasi wedding lehenga, which she has paired with a beautiful ivory choli and net dupatta! This lehenga by Ayush Kejriwal is all the inspiration you need if you're planning to wear a Banarasi lehenga on your big day. The zardosi and gota hem paired with an embroidered dupatta is giving out regal vibes! Red will forever be a classic when it comes to Banarasi wedding lehengas! This gold and red Banarasi lehenga is no exception to that. Love how the bride chose to break the monotony of the lehenga pattern with a brocade gold butti blouse! This Banarasi bridal lehenga is perfect to add a hint of sunshine to your pre-wedding ceremonies. Opt to wear something like this during haldi and you’re good to go for the mad riot of haldi that will be thrown around at the event! This royal blue Banarasi lehenga is a fine example of why bridal lehengas don’t have to be heavy in weight to look festive and bridal. The gold and pink thread work on the blue lehenga is perfect to add a pop of colour to your wedding festivities! An orange lehenga with deep green choli like this one is something bridesmaids can definitely have on the top of their ‘to wear for wedding’ list. Bollywood’s newest sister duo is giving major bridesmaids outfits goals in these opulent Banarasi lehengas! Don’t you girls agree? North meets south with this beautiful Banarasi lehenga design, which this bride chose to pair with a contrasting maggam work blouse and pulling it off like a total boss! This beautiful bride in her maroon Banarasi lehenga paired with a sheer jacket is absolute #mehndiwear goals! This green Banarasi wedding lehenga paired with a solid yellow choli is such a gorgeous choice to wear for your daytime mehndi function. Gota jewellery will only take this lehenga to another level. A lightweight Banarasi lehenga like this one is the ideal choice for bridesmaids to wear for a pre-wedding function like haldi or mehndi. Tip: Accessorize it with chunky oxidised jewellery and beautiful juttis to complete your OOTD! Nothing makes a bridal lehenga look more opulent than the perfect shade of red combined with gold. This beautiful Banarasi lehenga is a testament to that! If you can’t decide on one colour for your Banarasi bridal lehenga, then a multicolour lehenga like this one is a good choice to opt. Check out more multicolour lehenga designs here! If you don’t wish to wear a heavy embroidered Banarasi lehenga, then you can pick something with gold buttis and minimal embroidery for a clean and chic look! This Banarasi wedding lehenga is something that no-fuss brides will totally love! The intricacy of the bright pink lehenga is offset with the navy blue choli making it look chic and modern! Tip: Pair with kundan jewellery to complete the look. Not a fan of bright colours? Black is always something to fall back upon. Doesn’t this black Banarasi lehenga with gold embroidery and brown choli look like a total stunner to wear for your cocktail party? Last, but not the least, if you are not a fan of Banarasi lehengas, here’s a beautiful floor-length Anarkali gown made with Banarasi silk that you can wear for one of your pre-wedding functions! How many of these Banarasi lehenga images did you save to your bridal board?